Magda’s motor racing career began with karting when she was just 9 years old and she quickly carved a successful path through national and international karting series races. Her first foray into rallycross took place in 2012 when she competed successfully in the nascent JRX entry class, which was run as a support category to the FIA ​​European Rallycross Championship in 2012 and 2013. She graduated to the FIA ​​European Rallycross Championship for Touring Cars in 2015 and 2016 where she emerged as the main title challenger becoming vice champion last season. 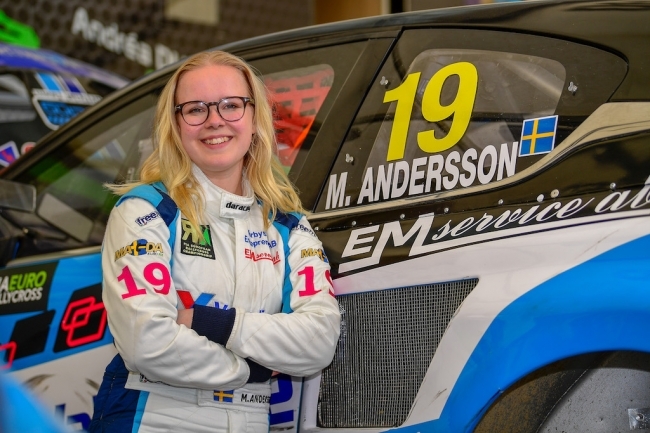 In 2017 Magda became the youngest ever female driver to contest the FIA ​​European Rallycross Championship for SuperCars as she embarked on the next exciting chapter in her motor sport career. In 2018 Magda continues on her SuperCar journey with DA Racing as she once again contests the Euro-RX premier series. Education: Graduate of the International Baccalaureate Diploma Program at Lund Cathedral School 2017. Ranked sixteenth in the 2017 FIA European Rallycross Championship for Super Cars. Vice Champion in the 2016 FIA European Rallycross Championship for Touring Cars. Fourth place in the 2015 FIA European Rallycross Championship for Touring Cars. Highest ranked female driver ever in an FIA sanctioned European Rallycross Championship. 2018 Recipient of the Best Woman category in the inaugural Ronnie Peterson awards. Hörby Municipality’s “ Athlete of the year 2017 “. 2017 Achievement of the Year Award from SMK Horby. 2016 Swedish National Team Driver of the Year. 2016 Driver of Year award from SMK Horby, the club’s most prestigious award. 2016 Female Driver of the Year Award by the Southern Swedish Motorsport Federation. 2015 Female Driver of the Year Award by the Southern Swedish Motorsport Federation.